Feds have pledged to end drinking water advisories on all reserves. Minister of Indigenous and Northern Affairs, Carolyn Bennett speaks as AFN National Chief Perry Bellegarde looks on at the Assembly of First Nations annual general meeting in Regina, Sask., Tuesday July 25, 2017. REGINA — Plans are underway to get a Saskatchewan First Nation clean water after more than five years under a drinking water advisory, and to meet a pledge to end such advisories on all reserves. Indigenous Affairs Minister Carolyn Bennett announced $9.2 million to replace the water treatment system on the White Bear First Nation, southeast of Regina. "I think everyone here will acknowledge it's been a long time coming and for far too long people in your community have not had access to potable water on reserve," Bennett said Tuesday in Regina, where the Assembly of First Nations was holding its annual meeting. "You should still have the same right as those of us in downtown Toronto to be able to turn on the tap and drink the water and bathe your babies safely — things that most Canadians take totally for granted." 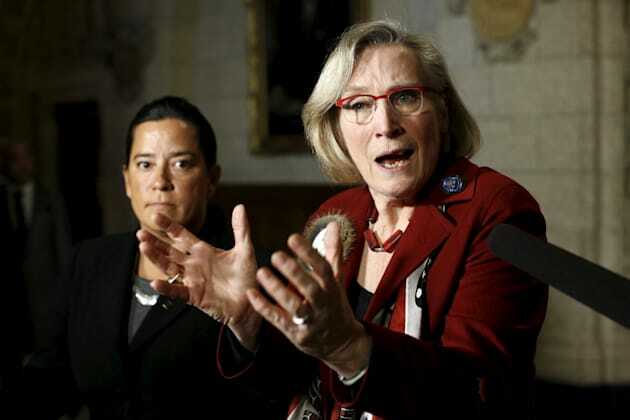 Indigenous Affairs Minister Carolyn Bennett (R) speaks during a news conference with Justice Minister Jody Wilson-Raybould on Parliament Hill in Ottawa, Canada, January 26, 2016. More than 800 residents on the reserve southeast of Regina haven't been able to drink their water since 2011. The project is expected to be complete by December 2018. The announcement is part of the federal government's commitment to end long-term drinking water advisories on public systems on reserves by 2021. During the 2015 election campaign, Justin Trudeau pointed to 93 different communities under 133 different boil water advisories and suggested he would address the issue as a top priority if his party formed government. You should still have the same right as those of us in downtown Toronto to be able to turn on the tap and drink the water and bathe your babies safely — things that most Canadians take totally for granted. Bennett said the government remains committed to its timeline, noting capacity is building in communities. "This five-year commitment is hugely important because most systems take about two to three years from the feasibility and the design to the implementation," she said. Bennett said the five-year plan for funding gives the government "real confidence that we're going get this done and get these long-term boil water advisories ended." "We know that there's a lot more to do, but we're well on track to lift the remaining ones within that five-year timeline that we promised," she added. Health Canada says that as of May 31, there were 97 drinking water advisories that had been in place for more than a year. However, Health Canada counts all on-reserve drinking water advisories regardless of who owns, operates and funds the system. Indigenous and Northern Affairs counts drinking water advisories for all on-reserve water systems that it directly funds and over which is has jurisdiction. It says the drinking advisory list now sits at 67. However, NDP Indigenous affairs critic Romeo Saganash said Tuesday that it is unlikely the Liberal government can meet its existing target without a credible plan. NDP MP Romeo Saganash speaks with the Star's editorial board on Jan 16 2012. "Canadians, First Nations communities have yet to see that plan," he said in an interview. "Where is it? I want to see how they intend to do this but they haven't been able to demonstrate that at all." There are professionals who can determine whether the existing timeline is within reach, Saganash added. "In my view, given that they are almost two years into their mandate and they haven't advanced much on this issue ... I don't think that that plan is realistic," he said.